My courgette celebrations are short-lived. 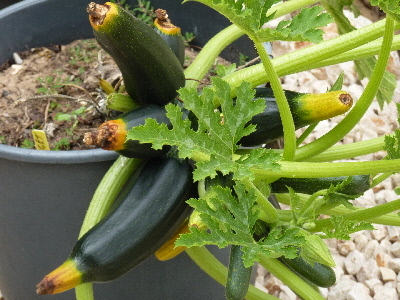 The zucchini (courgettes) have matured but the problem of rotting and yellowing ends return. I despair! My tale of woe is shared with my favourite gardening expert, Gene, who I just happen to meet in a supermarket 90kms from where we both live. What a stroke of luck!. Gene listens carefully, asks questions thinks carefully and then pronounces his diagnosis – I am watering the zucchini (courgettes) too much and they need more nutrients. Don’t you just love people who stand in the middle of the supermarket isle chatting, totally oblivious to the trolley jam they are causing? What a challenge growing vegetables is proving to be but enjoyable nonetheless. oh dear! What a shame, especially after you have taken so much care in growing them! I hope watering less will sort out the problem for you. Yes, it was a stroke of luck meeting up with Gene. He is the resident expert at our local gardening club. Fingers crossed and postitive thoughts.